The impossible looking Crown Las Vegas hotel is inching towards becoming an actual real-life project, rather than just an architect’s outlandish dream. Now outlandish in Las Vegas terms is pretty normal, of course – in fact, you can’t build a hotel on the strip unless it’s more outlandish than its neighbours. But the Crown Las Vegas really does intend to be the most outlandish of all, as it’s set to rise some 1,888 feet tall – that’s 700 feet higher than the Stratosphere! The people behind the Crown Las Vegas, PBL, have just filed papers recently with the Clark County planning commission outlining their plans for the super-huge hotel. 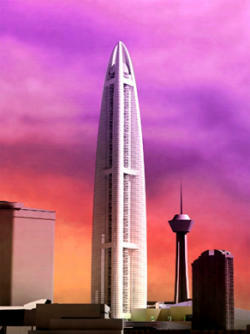 These plans include a 142 floor monstrosity that would dwarf everything all around it. Featuring 5,000 rooms and tonnes of retail, restaurants, gaming, spa and convention center space, the Crown Las Vegas would be the tallest building not just in Las Vegas, but in the whole of the US, rising some 400 feet above the Sears Tower in Chicago (the current tallest). Unfortunately for PBL, their plans could be scuppered by the FAA, who are worried that the building would be a flight hazard to planes landing at McCarran airport. Really? You mean pilots taking off and landing wouldn’t see a 1,888 feet tall building?! Should we be worried about this?! Aside from this, there’s also the thought that the hotel itself might not be that profitable. Hugely tall buildings need to transport visitors from their rooms to ground level (and, of course, casino level) quickly. If you don’t do this efficiently, you get disgruntled guests, not to mention guests who can’t actually get to your casino. Even a hotel as (relatively) small as Circus Circus can take up to 20 minutes to get out of the building. Actually, it can take longer than that. During my stay last year, three of the lifts had broken down, leaving just one lift for the entire tower. After waiting 10 minutes, I gave up and used the stairs, which took me another 15 minutes! Imagine doing that in a tower that’s 1,888 feet tall?! Whether PBL get permission to build their monstrosity to the height they want to remains to be seen, but it seems they’re serious about building it, so one way or another, the Stratosphere could soon have a seriously tall neighbour!